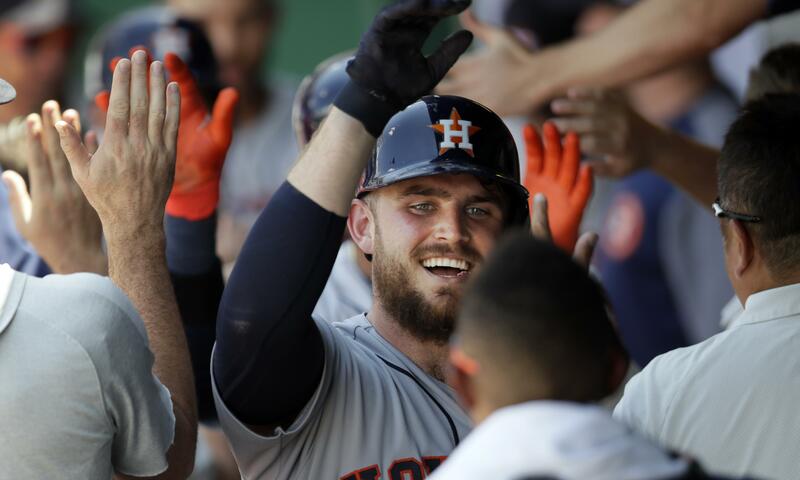 The Houston Astros won their 10th straight game, with Dallas Keuchel getting three-run homers from Max Stassi and Alex Bregman to rout the Kansas City Royals 10-2 on Saturday in Kansas City, Missouri. Keuchel (4-8) began to emerge from a monthlong funk, allowing two unearned runs and six hits in six innings. The 2015 Cy Young winner had surrendered a combined 17 runs over his last three outings, and had not won since tossing seven scoreless innings against Texas on May 13. Danny Duffy (3-7) had been pitching well of late, but the Royals left-hander allowed seven runs on seven hits and three walks in six innings. Yankees 4, Rays 1: In New York, Luis Severino pitched eight sharp innings and New York won for the 13th time in 16 games with a victory over Tampa Bay. Giancarlo Stanton and Sanchez hit back-to-back home runs to help the Yankees send the Rays to their 18th loss in 22 games at Yankee Stadium. Severino (10-2) simply overwhelmed a weak-hitting Rays lineup that has produced just one run over its last 21 innings. The 24-year-old righty gave up three hits, struck out nine and walked two, tying Cleveland’s Corey Kluber for the A.L. wins lead. Chasen Shreve gave up a leadoff homer in the ninth to Matt Duffy, who went deep for just the fourth time this year. Jake Bauers followed with a triple and Aroldis Chapman then set down the next three batters for his 20th save. Ryan Yarbrough (5-3) gave up a run in the second on rookie Gleyber Torres’ two-out double. Didi Gregorius hit an RBI single in the third. Tigers 7, White Sox 5: In Chicago, Nicholas Castellanos homered twice and Jose Iglesias hit a tiebreaking RBI single in Detroit’s two-run eighth that carried the Tigers past Chicago for their fourth straight win. Victor Martinez sparked the winning rally in the eighth with a leadoff single against Jace Fry (0-1). Bruce Rondon then walked John Hicks and couldn’t make a diving grab of JaCoby Jones’ bunt popup, loadiing the bases. Iglesias hand a run scoring infield sing and Niko Goodrum drew a four-pitch walk. Blue Jays 2, Nationals 0: In Toronto, Max Scherzer lost his second straight start for the first time since 2015 when Marco Estrada pitched 6 2/3 shutout innings and Devon Travis homered to lead Toronto past Washington. Scherzer (10-3) gave up four hits, including the two-run homer by Travis, in six innings. The two-time N.L. Cy Young Award winner struck out 10, increasing his major league-leading total to 152. Estrada (4-6) allowed three hits, one a bunt single, to win back-to-back starts for the first time this season. Danny Barnes and Aaron Loup each got two outs and former Nationals closer Tyler Clippard finished the three-hitter for his third save in six opportunities. Braves 1, Padres 0: In Atlanta, Sean Newcomb pitched six scoreless innings and Charlie Culberson homered to lead Atlanta over San Diego. The N.L. East-leading Braves improved to 25-7 when their starter pitches at least six innings, and Newcomb has been a big reason for the success. Marlins 5, Orioles 4: In Baltimore, J.T. Realmuto homered twice and had four RBIs off Alex Cobb, and Miami handed Baltimore its ninth straight loss. Jonathan Schoop homered and Manny Machado had two RBIs for the Orioles. They have gone more than a month without winning at Camden Yards. Wei-Yin Chen (2-3) limited Baltimore to three runs over six innings to earn his first victory since April 28. Drew Steckenrider worked the ninth for his first save. Cobb (2-9) allowed five runs and seven hits over seven innings. Athletics 6, Angels 4: In Oakland, California, Stephen Piscotty hit a tiebreaking, two-run single with two outs in the sixth inning and Oakland held on to beat Los Angeles. Sean Manaea (6-6) pitched four-hit ball and allowed three runs over six innings. The left-hander retired the first 12 batters, stumbled through a shaky fifth, then recovered for his first win in more than a month. Chris Young hit a three-run home run for Los Angeles. Semien homered leading off the sixth to chase Angels starter John Lamb. Reliever Noe Ramirez (2-3) hit Pinder with a pitch, walked Khris Davis an out later before hitting Matt Olson to load the bases. Ramirez struck out pinch-hitter Dustin Fowler but Lucroy walked to force in the tying run and Piscotty hit a two-run single. Pirates 6, Reds 2: In Pittsburgh, Josh Harrison hit a two-run homer, Colin Moran and Elias Diaz added solo shots and Pittsburgh pulled away from Cincinnati. Ivan Nova (4-5) worked through heavy traffic in six innings to pick up his second victory in two starts since returning from the 10-day disabled list with a sprained right ring finger. Rockies 5, Rangers 2: In Arlington, Texas, Adrian Beltre hit a tiebreaking two-run triple in the eighth inning, and Texas snapped a seven-game losing streak. Delino DeShields drew a leadoff walk against Harrison Musgrave (0-2), and went to third on Jurickson Profar’s single. Both scored on Beltre’s 38th career triple. Ryan Rua took over as a pinch runner and came home on Rougned Odor’s sacrifice fly. Twins 9, Indians 3: In Cleveland, Indians starter Carlos Carrasco was pulled after he was struck on the right arm by a line drive, and Minnesota got four hits from Eddie Rosario in a win over Cleveland. Rosario hit his 16th homer for the Twins, who have won five straight against the A.L. Central leaders to improve to 6-2 against Cleveland this season. Rosario also scored four times, drove in two runs and swiped a base. Phillies 4, Brewers 1: In Milwaukee, Rhys Hoskins and Andrew Knapp hit home runs and Philadelphia overcame stranding 15 runners on base to beat Milwaukee. Zach Eflin (4-2) beat Milwaukee for the second time in a week. The Brewers began the day with the best record in the National League, and had scored 40 runs against the Phillies in four previous games before being stymied by Eflin and four relievers. Hoskins hit a towering home run in the fourth off the window of a restaurant on Miller Park’s third level to tie the score at 1-1. Junior Guerra (3-5) had retired eight in a row before Hoskins, who also doubled, singled and walked, hit his ninth homer. Mariners 1, Red Sox 0: In Seattle, Wade LeBlanc pitched into the eighth inning and Nelson Cruz had an RBI single as Seattle beat Boston. LeBlanc gave up just two hits and struck out nine over 7 2/3 innings. After a single by Mookie Betts on the opening at-bat of the game, LeBlanc (3-0) retried the next 22 batters until Eduardo Nunez singled with two outs in the eighth. Alex Colome got pinch-hitter Mitch Moreland to pop out to end the inning, and Edwin Diaz struck out the side in the ninth for his 27th save. Dodgers 3, Giants 1: In Los Angeles, Enrique Hernandez and Matt Kemp each homered for the second consecutive game, Alex Wood got his first victory since May 20 and Los Angeles beat San Francisco. Hernandez hit his 10th home run and fourth career against starter Madison Bumgarner. Kemp hit his 12th home run and has reached base in 15 of his last 18 games against the Giants. Both players went deep in a 3-2 win Friday over the Giants. Cubs 6, Cardinals 3: In St. Louis, Addison Russell and Jason Heyward homered and Ian Happ’s double broke a 3-all tie as the Chicago rallied to beat St. Louis. Cubs starter Kyle Hendricks (5-6) gave up three runs and seven hits in six innings, snapping a career-high three game losing streak. Brandon Morrow got the last three outs for his 16th save in 17 chances. Mets 5, Diamondbacks 1: In Phoenix, Michael Conforto hit a three-run home run and added an RBI double to power New York past Arizona. Steven Matz picked up the win for the Mets, pitching 6 2/3 innings and allowing one run on six hits with three strikeouts. Published: June 16, 2018, 10:08 p.m.